Together they have performed in a variety of venues, such as the Tate Modern - linking photography and music as part of the ‘Red star over Russia’ exposition, as well concert halls in the U.K, Italy and Spain. They have had the privilege to work with great musicians dedicated to chamber music, namely Alina Ibragimova (Chiaroscuro Quartet), Pablo de Pedro Cano (ECO, Edding Quartet), Antonello Farulli (Reina Sofia chamber music teacher), Magnus Ericsson (Oslo Conservatoire), Peter Herresthal (Oslo Philharmonic Concertmaster), Ilmar Gavilán (Harlem quartet), Mark Messenger, Nathan Braude, Cecilia Ziliacus, Bartholomew Lafollette and Avri Levitan. They have also been invited to be the resident chamber ensemble for the festival 'Musethica' in Zaragoza and each member, individually, is a regular of International Chamber Music Festivals, the likes of IMS Prussia Cove Open Chamber Music, Santander Festival, Musica Mundi chamber music festival, Summer Academy Voksenåsen in Oslo, East Neuk retreat and Manchester Quartet Week. 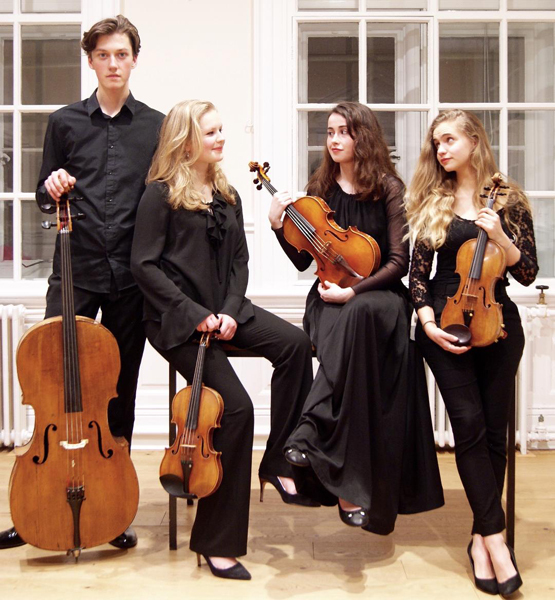 The Artha Quartet were recently awarded the Helen Just & Susan Connell Prize and The Sacconi Quartet Prize as well as given the opportunity to perform the well-acclaimed ‘Kaiser’ Haydn Quartet at the Wigmore Hall. They are looking forward to performing Dvorak’s Viola Quintet in Berlin with Avri Levitan and Schubert’s Cello Quintet with Thomas Carroll later this year. Ana Dunne Sequi was born in Madrid in 1997 where she studied with Avri Levitan at the Centro Integrado de Música “Padre Antonio Soler” in San Lorenzo de El Escorial, Madrid, where she finished with the highest distinction. She has received awards in chamber competitions and has taken part in several orchestral projects, working with renowned conductors the likes of Bernard Haitink, Lawrence Foster or George Pehlivanian. She has received solo and chamber masterclasses from Maxim Rysanov, Lawrence Power, Avri Levitan, Michael Kugel and Tabea Zimmermann, to name a few. As a soloist, she performed Telemann’s viola concerto with the El Escorial Baroque Orchestra and and has had the opportunity to perform in various cities in Europe such as Brussels, Aalborg, Madrid, Zaragoza and London. Ana has performed with the Sacconi Quartet and the Apaches Trio and was invited to participate in the Wigmore Hall Learning National Young string Quartet Weekend in Manchester. Most recenly she was also invited to take part in the Musethica festival in Berlin. As a keen chamber musician, she is a member of the newly-formed Artha quartet with whom she has performed in venues and festivals such as the Tate Modern Gallery, Chipping Campden festival, Musethica chamber festival, and Wigmore Hall in London. She is currently studying at the Royal College of Music with Nathan Braude, generously supported by the Henry Wood Award. She also receives lessons from Antonello Farulli. 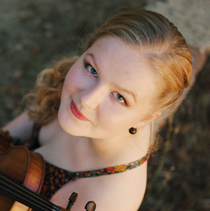 Ana was recently awarded first prize in RCM viola competition 2018 as well as being a recipient of the Helen Just & Susan Connell Prize and The Sacconi Quartet Prize as a quartet member of the Artha Quartet. Charlotte Saluste-Bridoux had an early start when she begged her parents for a violin at the age of two. Born in France she was taught by François Gilles and Aude Périn-Dureau at Montpellier's Conservatoire à Rayonnement Régional. She has received masterclasses from violinists including Ana Chumachenco, Zakhar Bron, Pavel Vernikov, Olivier Charlier, Leonid Kerbel, András Keller and Gordan Nikolic and recently played Sibelius Violin Concerto for Maxim Vengerov at the RCM. 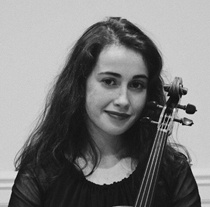 In 2009, Charlotte entered the Yehudi Menuhin School to study with Natalia Boyarsky and is further pursuing her studies at the RCM in a shared class between Natalia Boyarsky and Alina Ibragimova on a full fees scholarship as a recipient of the Geoff and Carole Lindey Award. Charlotte won the RCM Violin competition in her 1st year at college in 2016, as well as the Bach prize. She was previously top prize-winner in the international Postacchini violin competition, Thomas Kuti european prize and Ginette Neveu Violin competition. Charlotte was chosen to be concertmaster of the RCM Symphony and Philharmonic orchestra on several occasions including for the well acclaimed performance of Rimsky-Korsakov Scheherazade in June 2017 which was also recorded in the Abbey Road studios. 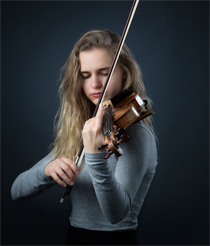 A passionate chamber musician she has taken part in the Prussia Cove International Musicians Seminar masterclasses as well as the Open Chamber Music in Cornwall, Santander Encuentro Festival, Musethica Chamber Festival and East Neuk chamber music retreat. She is the 1st violin and a co-founder of the Artha Quartet. Charlotte recently performed Joseph Joachim violin concerto in Budapest and a Wigmore Hall concert with the Artha Quartet. She is currently playing on a Giovani Batista Ceruti violin, kindly loaned to her by the RCM. Silvestrs Kalnins began to play the cello at the age of five with his teacher Dace Puce in Riga, Latvia. He is now studying with Melissa Phelps at the Royal College of Music in London as an ABRSM Scholar, supported by the Henry Wood Accommodation Trust. 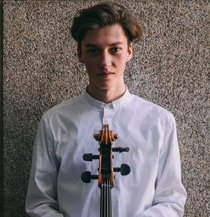 Silvestrs has been a prize winner in several competitions, most significantly, he was awarded 1st prize in 2014 in the Karl Davidov International Cello Competition in Kuldiga. In 2016 he won 1st prize in the competition for young performers organized by the Inese Galante Foundation and this year he was awarded a scholarship by Raphael Sommer Trust. He has participated in masterclasses with Frans Helmerson, Torleif Thedeen, Marko Ylonen, Sennu Laine, Denis Severin, Henrik Brendstrup and Ole Eirik Ree amongst others. 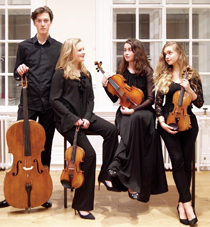 Silvestrs has played with various artists including Nabuko Imai, Marta Gulyas, Hansjorg Schellenberger, Cecilia Zilliacus, Avri Levitan and currently is a member of the prize winning Artha String Quartet. This year he has been invited to perform in the Chipping Campden Festival, Musethica Chamber Music Festival, the Wigmore Hall in London and “Encuentro de Santander” Music Academy in Spain. He was also selected as a member of the 2018 European Union Youth Orchestra. Luxembourg violinist Line Faber performs regularly as a soloist and chamber musician in Belgium, Luxembourg, United-Kingdom and Italy. Line studied as “young talent” at the Royal Conservatory of Brussels with Leonid Kerbel. She is currently studying at the Royal College of Music in London with Mark Messenger. She was awarded a first prize and a gold medal at the 33rd Luxembourg competition for young soloists, has been finalist of the 19th Jeunesses International Music Competition in Bucharest and has recently won the Jacob Barnes Award together with her piano duo partner Maria Tarasewicz. Line has been working in masterclasses with Yair Kless, Dora Schwarzberg, Ivry Gitlis, Isabelle van Keulen, Alina Ibragimova and Ulf Wallin. As a chamber musician Line performed with the Harlem Quartet, Trio Apaches and Nicola Benedetti. She received coaching from Julian Rachlin, Renaud Capuçon and the Altenberg Trio Wien. She is a founder member of the prize winning Artha String Quartet. Line has participated in various Festivals such as Musica Mundi International Chamber Music Festival in Belgium, Voksenasen Academy Oslo and Musethica Festival in Spain. As a soloist she has appeared with orchestras such as the I musici Brucellensis Orchestra and the Brussels Chamber Orchestra. More recently she performed Beethoven’s Violin Concerto with the RCM Symphony Orchestra in a masterclass conducted by Maxim Vengerov. Line plays an 18th Century violin made by Lorenzo Storioni generously on loan from a private individual.